ANALYSIS: The past of Frazier Glenn Miller, who has been accused of gunning down three people at Kansas City-area Jewish centres, is a window into the American white supremacist movement. 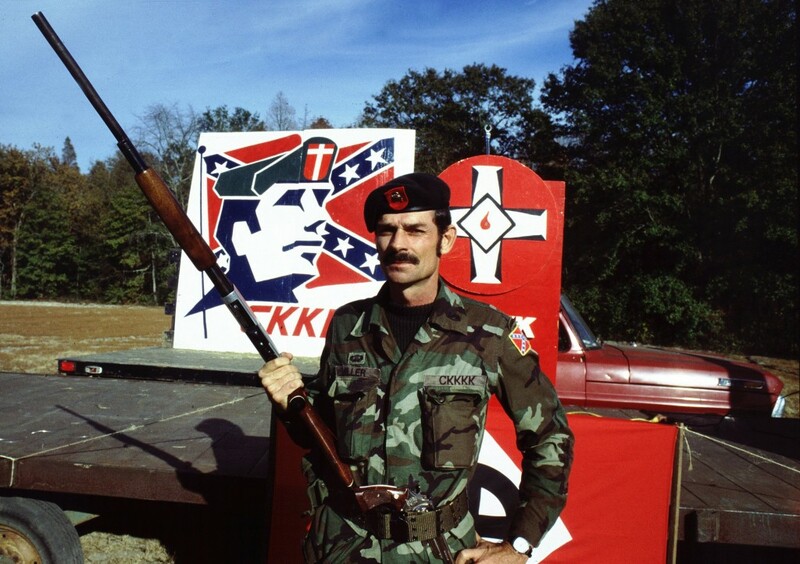 Alleged Kansas gunman Frazier Glenn Miller poses with a shotgun and a pistol tucked into his military-style web belt before a Carolina Knights of the Ku Klux Klan rally in Robeson County, N.C., in November 1984. Photo by Scott Sharpe/Raleigh News & Observer/MCT/ABACAPRESS.COM/SCANPIX. Copyrighted. On April 13, the eve of Passover, three people were killed in two separate shootings in Overland Park, Kansas – one at a Jewish community center, one at a nearby Jewish assisted-living home called Village Shalom. William Lewis Corporon, a retired physician, and his 14-year old grandson, Reat Griffin Underwood, died after being shot at the community centre. Terri LaManno was killed in the Village Shalom parking lot. The police soon arrested a suspect, a man in his seventies. A TV crew caught him yelling “Heil Hitler!” from the back of a police car. 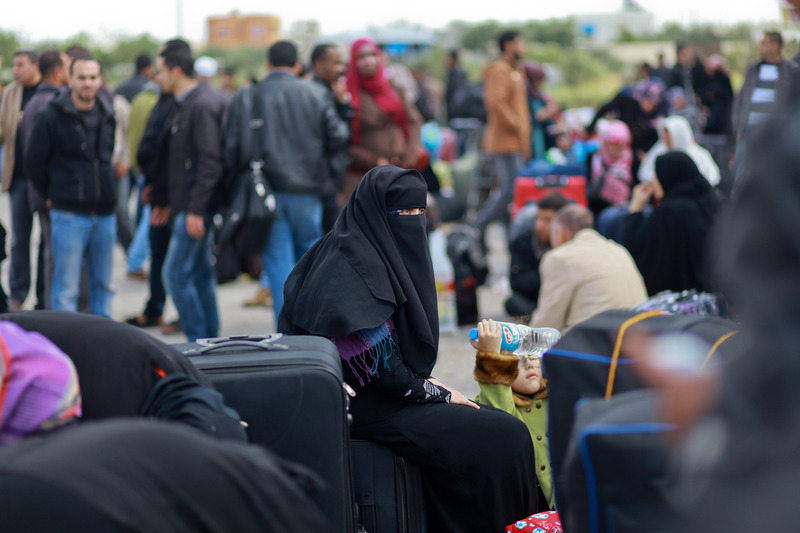 Although none of the victims was in fact Jewish – LaManno was a Catholic, the other two Methodists – the attack bears the hallmarks of an anti-Semitic hate crime. On Sunday night, the authorities identified the suspect as Frazier Glenn Miller, a 73-year old living in the small town of Aurora, Missouri. While Miller appears to have acted alone, and is already being described as a “lone wolf”, he has had a long career in the American white-supremacist movement. He has been an activist, a leader, a publisher and distributor of racist newspapers and a perennial candidate in elections, having run in both Democratic and Republican primaries, as well as an independent. Miller was in the army at the time, and so could not fully devote himself to the NSRP, but he “immensely enjoyed reading each monthly edition” of the Thunderbolt, and also ordered and read books recommended by the party, including Adolf Hitler’s Mein Kampf, William Gayley Simpson‘s Which Way Western Man and Wilmot Robertson’s Dispossessed Majority. He also started reading Robertson’s magazine Instauration and William Pierce‘s National Vanguard. 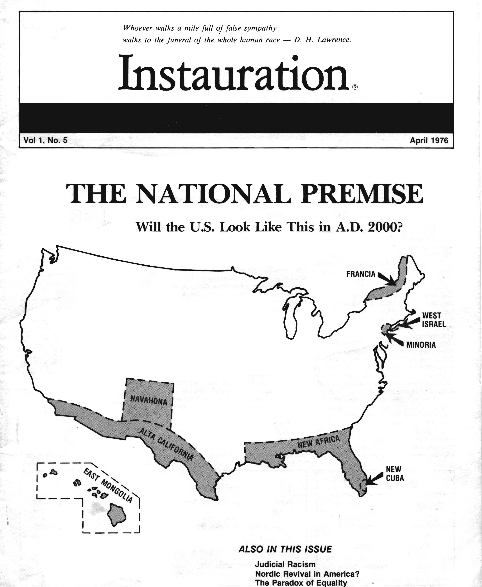 A 1976 edition of Instauration Magazine, focusing on the future of the United States, and suggesting that Hawaii would become “East Mongolia”, Florida and parts of Alabama and Louisiana “New Africa”, the Miami area “New Cuba”, and parts of the southwestern USA “Alta California”. The map also features “New Israel”, “Francia” and “Navahona”. After some time, however, he grew disappointed by the NSRP’s lack of ability to attract new members, and joined the National Socialist Party of America (NSPA), specifically Harold Covington’s group in North Carolina. Covington was a veteran of another American Nazi group, the National Socialist White People’s Party, and had been spending time in apartheid-era South Africa and in the unrecognized white minority-ruled Rhodesia (modern-day Zimbabwe). Covington was a founder of the minuscule Rhodesian White People’s Party. He also claimed to have fought in the Rhodesian Army. In 1976, however, he was served with a prohibited immigration order, and deported from the country. Upon his return to the United States, he settled in Raleigh, North Carolina – not far from where Miller lived at the time. There Covington joined the NSPA. Harold Covington was born in Burlington, North Carolina, in 1953. Since his resignation as president of the NSPA in 1981, he has also lived in the United Kingdom, where he made contact with British right-wing extremist groups and was involved in setting up the violent group Combat 18 in 1992. Returning again to the United States, he started a new group, the National Socialist White People’s Party (NSWPP), launching its web site in 1996. He has since founded the Northwest Front, which advocates the creation of an “Aryan homeland” in the Northwest, and currently runs a blog called Thoughtcrime, as well as a podcast, Radio Free Northwest. Covington has also written a number of novels, including the so-called Northwest Quintet, published between 2003 and 2012, which present a fictionalized account of the rise of a future Northwest American Republic, which ejects all non-Whites and becomes a regional superpower. Why did I tolerate Braswell if he was such a loon? The answer is simple and tragic. I liked him. I knew he was crazy, but he was crazy in an engaging sort of way. Both Frank and Pat have a personal charm which tends to mask their character defects, and this charm has allowed them to pull the wool over many a White patriot’s eyes for some time. In this way they have had the operational assistance of a number of enthusiastic proponents, including me. I am as much responsible as anyone else for the Braswells’ inflated reputations in the Movement. I covered their flamboyant gunfights in NS publications, neglecting to mention that the assailants were not Israeli commandos or gin mad niggers but the irate relatives of Braswell’s first wife and his daughter’s jilted boyfriend. Footage of the Greensboro massacre has been posted on YouTube (Warning: strong images). Those White men were justifiably scared half to death. They were trapped and surrounded by hundreds of screaming Blacks and Communists in the heart of a Black neighborhood. And Communists not only attacked them with clubs, many were firing pistols at them. […] The Communists not only started the fight by screaming “Death to the Klan!” at us and by beating on cars with clubs, they actually fired the first gunshots, when one of them fired at me. Unfortunately for the Communists, they only had small caliber hand guns. The Klansmen and Nazis had high-powered rifles and shotguns. Also, many of the Klansmen and Nazis were military veterans, while the Communists were for the most part, intellectual city types, with little or no training in firearms. The Blacks simply ran, hundreds of them. This is why all the deaths and serious injuries were suffered by the Communists. On April 27, 1981, the Canadian neo-Nazi Wolfgang Walter Droege and eight other men, including the prominent American white supremacist Don Black, who later founded the leading white supremacist web site Stormfront, were arrested by federal agents in New Orleans as they prepared to board a boat with weapons, explosives and ammunition. Together with Mike Perdue, a long-time Klan member, they had planned “Operation Red Dog”, a plot to overthrow the government of the Caribbean island of Dominica and reinstall its former prime minister. Their plan was to make money on tourism to support white supremacist movements across the world. See more: Steward Bell, The Bayou of Pigs, The True Story of an Audacious Plot to Turn a Tropical Island into a Criminal Paradise, Wiley, 2008. In 1984 Miller and several other members of the Carolina Knights ran for public office – Miller in the Democratic primary election for Governor of North Carolina. He won a mere 0.61 per cent of the votes, or 5,790 votes, but managed to get further publicity for the group. That year he also changed the name of his organization to the Confederate Knights, and he preached about securing the Southern United States as a white homeland. In 1983 and 1984, the terrorist group The Order, also known as Brüder Schweigen or the Silent Brotherhood, was active in the United States. This white supremacist group was founded by Robert Jay Mathews in late September 1983, its goal an outright revolution against the American government, which Order members believed was controlled by a cabal of prominent Jews, the so-called Zionist Occupation Government, or ZOG. 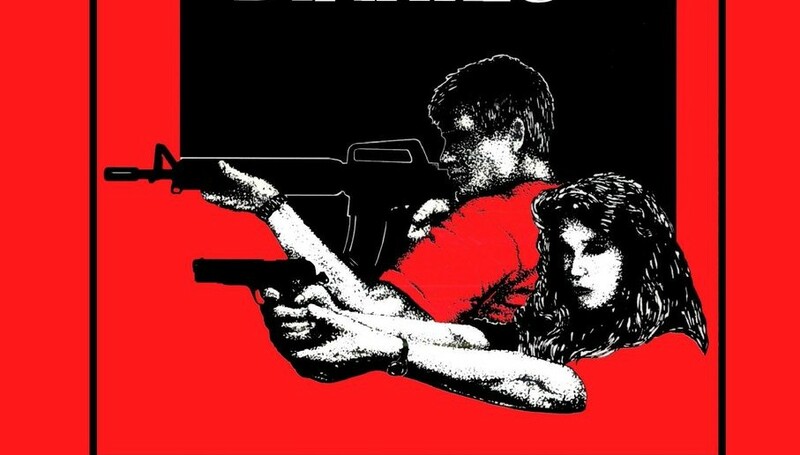 The Order was named after, and drew inspiration from, a fictional group in the novel The Turner Diaries – a genocidal fantasy written by the already mentioned William Pierce. “I’m giving you $75,000 now, and I’ll bring you another $125,000 in six weeks,” said the leader of “The Order,” Robert Jay Mathews, as he sat calmly in my living room in mid August 1984. “We’ve been getting great reports on your organization, and we want to help it get even better,” continued the clean-cut, boyish looking 31-year-old Texan. In December 1984, the authorities tracked Mathews down to a house on Whidbey Island, Washington. He refused to surrender. During a shootout, the house was ignited by incendiary flares, and Mathews was killed in the fire. In white supremacist circles, he is considered a martyr. According to Miller, David Lane – who had been the getaway driver when Alan Berg was murdered – came to him in early 1985, “with the FBI hot on his tail”, asking Miller to hide him. Miller refused to do so, but eventually one of his associates brought Lane to a mountain cabin just over the Virginia border. By 1985, Miller’s organization had 23 local units, and, according to a report from the Southern Poverty Law Center, an estimated 1,000 members. Like The Order, it also had a revolutionary side. The group engaged in paramilitary training, which was publicized in Miller’s newspaper, now called The Confederate Leader. In March 1985, Miller changed the name of the group once again. It became the White Patriot Party. However, he was soon to land in trouble. After a law suit carried out by the Southern Poverty Law Center, his group was prohibited from operating a paramilitary army. When the paramilitary training activity did not cease, Miller was found in criminal contempt and sentenced to six months in prison. 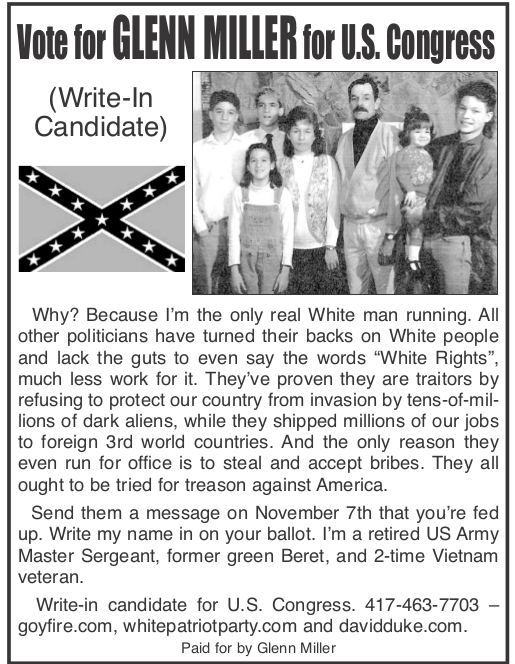 While his conviction was under appeal in 1987 he went underground, travelling to Missouri, and issuing a supposed declaration of war “[i]n the name of our Aryan God […] against Niggers, Jews, Queers, assorted Mongrels, White Race Traitors, and dispicable [sic] informants”. Soon thereafter federal agents arrested Miller on chargers related to this declaration and to explosives violations. In a plea bargain, he pleaded guilty to possession of a hand grenade, and also agreed to testify against other leading white supremacists, including members of The Order. His plea bargain did not win him many friends in white supremacist circles, and after getting out of prison, Miller laid low until he self-published his autobiography in 1999, moving first to Iowa and then to Missouri. The anti-White, Jew-controlled, opinion-shaping mass media do not want the restless, victimized White majority to get riled up at what’s obvious: that we are under siege by Jews and other protected minority criminals and invaders. And so now you know why America is flooded with tens-of-millions of colored aliens with tens-of-millions more on the way; why millions of American jobs are shipped to foreign countries; why the government legalized the abortion murders of over 35 million White gentile infants; why faggots have been legalized; why White gentile Americans have become 2nd class citizens and discriminated against; why Christian prayers and the Christian bible were kicked out of public schools; why the government and media work together to exterminate the White race; why we fight and finance Jew wars to protect Israel and world Jewry; why our government is turning us over to a one world government; and all the other insanities that are destroying our freedoms, liberties, national sovereignty, and our very Race. The U.S. government and the establishment media are our enemies because they are controlled by jews [sic]. It’s as simple as that. Instead, Miller ran as an independent write-in candidate, receiving 23 votes. In 2010, he ran in Missouri’s U.S. Senate election, once again as an independent write-in candidate. While he gained even fewer votes, a whopping seven, his candidacy got him air time. As he himself noted on the extreme right-wing web site Vanguard News Network, “stations are required to run advertising for candidates, […] public speaking opportunities we can’t afford to pass up”. Controversy surrounding his advertisements led to Miller being interviewed on The Alan Colmes Show, The Distorted View Show, The Howard Stern Show and The David Pakman Show. Alex Ruedy Linder, born in 1966, is the owner and operator of the Vanguard News Network, a strongly anti-Semitic, white-supremacist website which was launched in 2000. 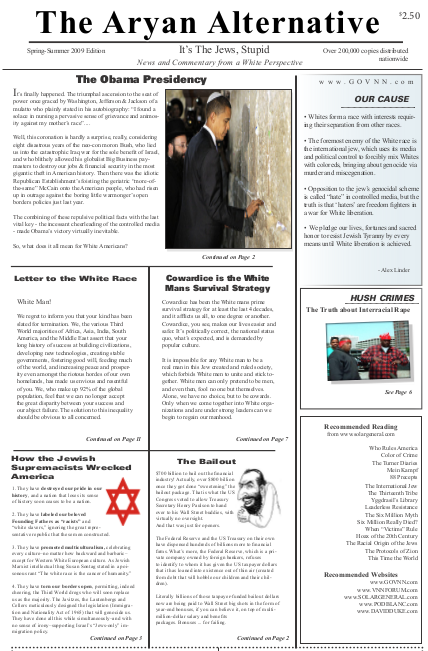 VNN is one of the most active white-supremacist sites on the Internet, and uses the motto “No Jews. Just Right”. He was formerly a member of the National Alliance, founded by William Pierce. See more about Linder: Profile on SPLCs web site. The world is awakening and standing up PUBLICLY . . . . while we type away cautiously. . anonymously. . invisibly. . and cowardly just like the lemmings we rail against. Get up off your knees – slither out of your hidden cellars – stand erect and boldly face the rising sun of the new day that’s here. Nothing meaningful to lose really, but your chains. Knowing what you know, is life really so sweet, you’ll live it as miserable, dwindling slaves to the GD jewbeasts ? ?